After several months of deliberation I finally purchased the Barska Starwatcher on the back of some extremely positive reviews. I can tell you now, I wasn't disappointed. There were a few things that prevented me from giving it a five star rating, namely the 45-degree diagonal and the tabletop tripod which I find are suited much better to terrestrial viewing. If you are considering using the scope for stargazing you'll want to use a good tripod and add a 90-degree diagonal in as well. The scope is sturdily constructed and has very good optics for the price. I live in a largely rural area and the views I get of the Moon are great, and viewing distant objects such as the Orion nebula are an absolute pleasure. Join in and write your own page! It's easy to do. How? 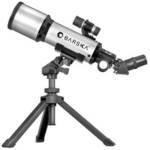 Simply click here to return to Barska Telescope Review.